Greatest Odyssey Video Slot Review - Casino Answers! 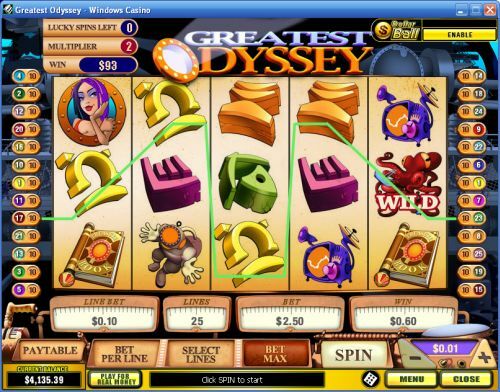 Greatest Odyssey is a 5-reel, 25-line video slot developed by Playtech, featuring a wild symbol, multipliers, a free spins feature, a bonus game and a progressive jackpot. You can play the Greatest Odyssey video slot at Bovada. The highest paying symbol on Greatest Odyssey is the Octopus symbol. If you land 5 Octopus symbols on a selected payline, you will win the 5000 coin top jackpot. The Octopus symbol is wild and will substitute for all symbols except for the scatter and bonus symbols. 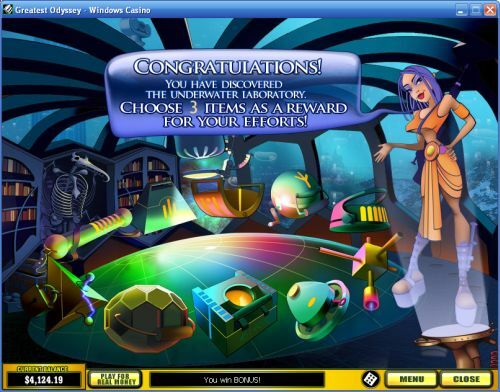 When 3 or more Scattered Treasure Book symbols appear on the reels, you will wiin 10 free spins with a multiplier of up to 25X. Use this feature to win big on the Greatest Odyssey video slot at Bovada! Greatest Odyssey features a Dollar Ball progressive jackpot sidegame. You can find the Dollar Ball sidegame in the top-right corner of the screen. You will be able to make $1 bets to play for the Dollar Ball progressive jackpot. It is a lottery game where you are given 5 numbers and if you are able to match all 5 numbers, you will win the Dollar Ball progressive jackpot. If you match 4 numbers, you will win 1% of the progressive jackpot. Even if you match 3, 2 or 1 numbers, you will still take home smaller prizes . Payouts are displayed in the Paytable. Only highest win per active payline. Winning combinations must be left to right (except scatter symbols). Payline wins are multiplied by the bet per line. You can find the Greatest Odyssey autoplay mode under “Menu.” You can play up to 9999 autoplay spins. Use the arrows to open up advanced settings in the Greatest Odyssey autoplay mode. You can set it to stop on jackpot win, on a single win more than (any amount you input), overall win more than (any amount you input), overall loss than (any amount you input) and you can also modify the delay between spins. You can stop the Greatest Odyssey autoplay mode at any time. The Greatest Odyssey online slot game has a good top payout, a bonus game, a free spins feature with the potential for some huge multiplier wins and also a progressive jackpot lottery sidegame. The presentation is pretty good, albeit not great. You can play the Greatest Odyssey video slot when you sign up today at Bovada! Are players from the United States able to play Greatest Odyssey for real money? No, players from the USA are unable to play the Greatest Odyssey slot game for real money at the moment. However, you can play the many excellent video slots at Bovada, including the Ocean Treasure Video Slot.